I also like to share all my work with the others, including my friends daddy and mummy. LOL! This display board is truly encouraging for me to work harder. But, hopefully I won’t become too boastful. Ha! These “Whole Brain Audio Subliminal Method” which carry the title of “Successful Child” and “Genius Power” are from Innertalk. They are specially bought for my little princess. So that good affirmations such as “I am happy”, ” I enjoy school”, “I am a good student”, “I like people”, “I can concentrate easily”, ” I learn easily”, “I do my best” , “I make friends easily”, “I am patient”, “I am attentive” from the title “Successful Child” will be input for little Elizabeth subconsciously and will help her to like her school life. Just like an insurance. But, not the ordinary life or business insurance. It’s for her happy life, be it in school or at home with positive thoughts and attitudes. What do you think? After all, mummy really believe in the power of subconscious brain. It’s absolutely worth trying. By the way, she started using it since Sunday. Nothing great has yet to be seen. Of course, mummy understand that this products need time to work well. So, just have faith. Wait and see. We were at book fair yesterday after little Liz finished her Kinder Beat. Not much for her. Only one book. And, these are the pictures in it. Simple. Thus, should be easy to learn. There are also soldiers, girls and cartoon figures in this book. But, Dinosaurs are her favorite. Anyway, she can’t really draw anything out yet. No particular shape or figure. Just some lines, curves and circles. Never mind. Mummy can see that she is trying. And, She loves it. At this age, drawing is certainly good for toddler’s brain development, especially right brain development. 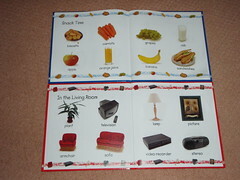 Through experience, Mummy realized that little Elizabeth does not like flash cards, she prefers books, especially those that separates the pictures of each item one by one like this. Yes! These are her 4 new books. These 4 are in a set. It’s another set of baby first words books. It’s simple, neat and all the pictures are so real. 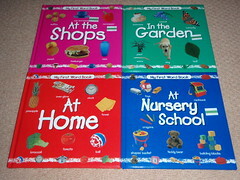 I think these 4 titles has so much for little Elizabeth to learn. They show things at the shop, in the garden, at home and at the nursery school. In fact, these 2 books were bought long ago. 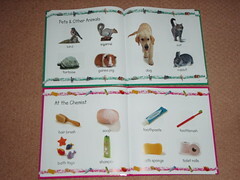 And, recently mummy actually bought other books for Elizabeth, But, she don’t seems interested. Somehow, mummy will keep buying books for her. Not that mummy wants her to become a book worm. But, it’s good for Elizabeth to like books and learn how to read. I think Elizabeth will fall in love with this “Donkey Ollie” immediately after she sees it. Elizabeth loves animals. I guess most kids like animals. Thus, we really got to thanks Car Angel (www.carangel.com) — a non-profit company that uses car and other donations to make videos for kids and teens. In fact, they have given away over 2.4 million videos. This is a great effort that not just about charity. It’s all the future of the precious little ones. I am sure the kids and teens will get excited with this cute and funny “Donkey Ollie”. So do Elizabeth. And, if these young ones followed the adventure of this “Donkey Ollie” closely, soon they will turn to someone who is well mannered. Anyway, weather there will be more and more “Donkey Allie” adventures to help mold the kids future, it all depends on your willingness to become the next car angel. Any boat, plane, house, RV or car donation to Car angel will be use to create more educational videos like this for the kids and teens.